There had been some argy bargy in the courts during the week when three Burnley residents were given custodial sentences for the heinous crime of refusing to pay poll tax. The public gallery was packed as the three were given 14 day sentences and all three received standing ovations from those in attendance. Two of the three facing prison were husband and wife, and parents of a 17-month-old child. They'd been shown no mercy despite pleas for them to be tried separately to ensure that, should they be jailed, it would be at different times. The grandfather of the child hit out strongly at the refusal to do so. Meanwhile, in Cliviger the water went black. It turned out this was because a discharge of coal dust from a mine had contaminated the water in a stream. It was serious enough for the owners of the mine to be fined £470. It wasn't all bleak and there was some good news locally that Manchester was moving into Burnley - and if that had been taken literally it would have thrown out one future Burnley manager's suggestion that the entire town could be fit into Old Trafford. The move came when the Burnley Express (East Lancashire Newspapers) won a contract to takeover a series of Greater Manchester newspapers. It meant greater production at the Bull Street headquarters and the introduction of an operational night shift. The Burnley Express had been running a competition and it had left one Burnley lady 'thrilled to bits'. She had won a 21" television and she was proud to proclaim that she'd probably now be watching Coronation Street on a bigger screen than most people in town. She was excited, but not quite so much as 40 scrabblers who turned out for the 8th anniversary of the Brierfield Scrabble Club. What an event it was and people arrived from as far away as Preston, Bradford and the Wirral for a big Scrabble competition. It turned out to be a big day for local man Michael Jessop who won the anniversary competition with a couple of double word scores and he run off with the first prize of a small cool bag and bottle. On the sports scene in town there was a lot of talk about a young schoolboy who was showing great prowess as a batsman. The 11-year-old cricketer was making a real name for himself and that the name MICHAEL BROWN could be one for the future. Whilst on the subject of local cricket, Burnley professional Chris Mack from Western Australia had agreed terms for 1992 and everyone at the other Turf Moor was delighted with the news. Next door, the big news ahead of the first home game was that Burnley would be without Joe Jakub and that really was big news. Joe had made his Burnley debut in our last ever First Division game against Coventry in April 1976. He'd left the club but returned in the summer of 1989 and in over two years had not missed a single game in either league or cup. An injury in the first half at Wigan ruled him out and that meant a return for David Hamilton who had completed a suspension following a red card in the previous season's play offs. If the home fans were hoping for a good start to the Turf Moor programme they were very disappointed during a first half that offered little as neither side were able to get anything like a foothold in the game. It took us nearly half an hour to create a chance and that fell to Roger Eli who managed to get a looping shot just under the bar only for Trinidad & Tobago international goalkeeper John Granville to save. It got niggly and it was a surprise that the referee didn't take any firm action, even when Aldershot's Mark Ogley was stretchered off after an ugly clash with Hamilton, who was Burnley's man of the match, saw him requiring stitches to a shin wound. Ian Measham also suffered an injury. He continued through to half time but soon into the second half he was forced off. By then the game had changed dramatically in Burnley's favour. Without a goal in the first half, most people wondered where one might come from. The answer came very early in the second half. 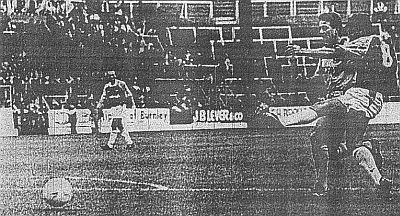 Burnley won a thrown in, taken by Ian Bray, to Eli who turned Shots' defender Kevan Brown and moved into the box. Brown, beaten, tugged at Eli's shorts and, with just 45 second half seconds gone, referee Alan Bennett pointed to the spot. Up stepped Mike CONROY who sent Granville the wrong way to give Burnley the lead. Three minutes later it was 2-0. Again Conroy was involved as he won a header to find Eli. This time Eli played in John FRANCIS who from 15-yards hammered a powerful shot that Granville didn't even have time to move to. The game had changed and it was all Burnley now. The crowd urged them forward for more goals and there was just one reason why they didn't come - goalkeeper Granville. He was simply magnificent as he made save after save, some of them stunning. The best of the lot denied latest signing Steve Davis his first Burnley goal. The defender stormed forward and sent a left footer from the edge of the box that was heading for the top corner. It looked to have beaten Granville but he didn't just keep it out, he caught it. He saved what could have been a rout in that second half but Burnley were happy enough with the 2-0 win and the first points of the season, totally unaware that months later those points would be taken away as Aldershot disappeared from the league. Manager Frank Casper was delighted. "I told the players at half time that they would get a goal, and they proved me right," he said. "Aldershot had a lot of experienced players in their team and I told the team that if we let Aldershot play football they would sort us out. But we stuck to our task very well and I was more than pleased with the end result." 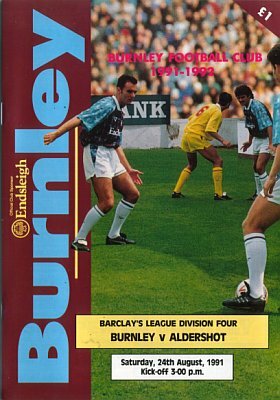 Burnley: Chris Pearce, Ian Measham (Andy Farrell 50), Ian Bray, Steve Davis, John Pender, Mark Monington, Roger Eli, John Deary, John Francis, Mike Conroy, David Hamilton. Sub not used: Steve Harper. Aldershot: John Granville, Kevan Brown, Leigh Cooper, Charlie Henry, John Flower, Mark Whitlock, Mark Rees, David Puckett, Keith Bertschin, Mark Ogley (Glen Burvill 39), Ian Stewart (Philip Heath 73). 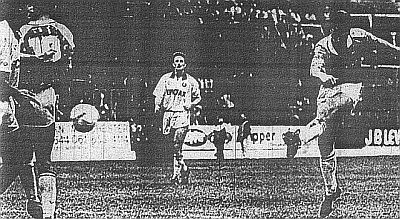 The results left Blackpool, Hereford United and Rotherham United as the only teams to record two wins on the first two weekends and Hereford it was who took pride of place with a 4-1 home win over Scarborough with John Narbett getting a hat trick including two penalties. Scunthorpe United's beat Doncaster Rovers 3-2 with the first two goals coming from future Clarets. Ian Helliwell gave them the lead before 19-year-old Graham Alexander got the second with his first goal in first team football.